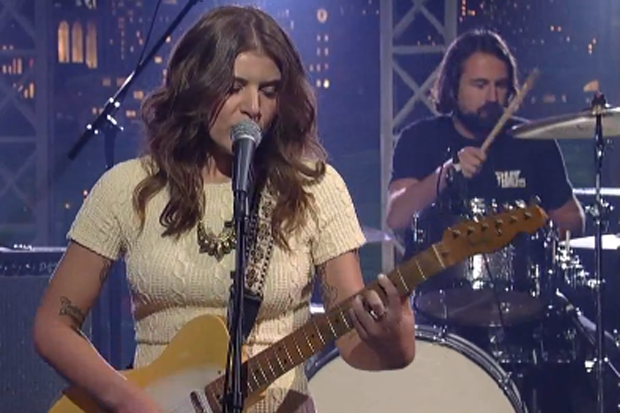 Best Coast dropped their second album, The Only Place, this week and we liked it. To celebrate their SPIN Essential the record’s release (and perhaps also frontwoman Bethany Cosentino’s recently launched Urban Outfitters line), Snacks’ mom and Bobb Bruno headed to Late Show With David Letterman to play its title track. The duo, backed by their touring rhythm section, dashed through the dreamy Cali tune sounding a little more grownup, one might say, showcasing how they’ve polished up a bit since the lazy, hazy days of Crazy for You (which we also liked).